My sugar rush from Sugar Rush has finally worn off and I'm happy to report that the event was a HUGE success. 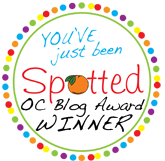 This cupcake event helped raise $4702.05 for Orangewood Children's Foundation!! Thank you to everyone who helped organize (Shastin), baked cupcakes, ate cupcakes, and donated money to this wonderful non-profit organization. Sugar Rush wasn't just a cupcake-eating event, it really was a cupcake extravaganza. In addition to the booths offering cupcakes, there were also just as many booths selling cupcake supplies, desserts, beanies, aprons, cookies, and cupcake crafts. I loved this booth selling milk...seriously what a smart idea! You could get chocolate, strawberry, or regular. My cute little nephew finally posed for a photo for me. In case you were hungry for non-cupcake food, you could choose from three food trucks -- The Burnt Truck, Kogi BBQ, and the Just Chillin' Ice Cream Truck. I chose to fill up on some sliders from the Burnt Truck. I was asked to be a judge in the cupcake competition. People assume this is an easy job, but after eating 17 cupcakes, I can honestly tell you that it's not. The other judges were Jason and Kim from Saturday Night Foodies and John Jennison, a cake artist. I've hung out with Jason and Kim at several other food events and they sure know food, especially the ins and outs of the food truck scene. Again, I love hanging out with people who are as passionate about food as I am. Coming up...the cupcake competition winners! MindyV is a one-of-a-kind, custom-made clothing company based out of London. They recently released a new clothing line called sweeTooth. 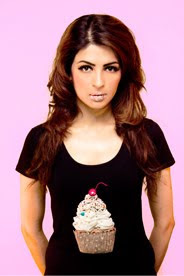 MindyV presents the exclusive new 'sweeTooth' t-shirt collection, inspired by the sweet things in life. Hand-made with their textures, colours, forms, and multitude of different beads, patchworks, motifs - to let you experience the 3Dimension (3D glasses not required). Satisfy your sweeTooth for style and order your one-of-a-kind must have statement key piece. Make the difference to your wardrobe...live life to the Tee. Every few weeks I come across an article proclaiming that cupcakes are dead or ______ will be replacing cupcakes this year. 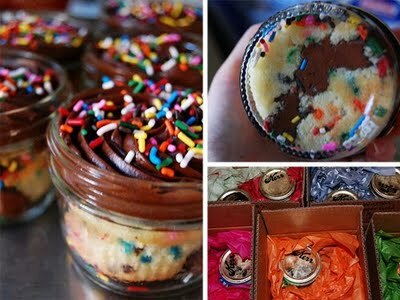 I've been seeing these kinds of articles for years, yet cupcakes are still gaining in popularity. Last Saturday was National Pie Day. Although I love cupcakes, I am certainly not opposed to other sweets. In honor of National Pie Day, Pardon My Crumbs posted her list of the top 3 places to get pies in LA. I've never gone out of my way to try a pie, but maybe it's time to do that. This week's episode of Cupcake Wars had some pretty crazy cupcake creations. For Round One, the four bakers had to make a cupcake using items you would find in a convenience store. The items included beef jerky, cheese puffs, yogurt-covered pretzels, nacho cheese, hot dogs, red licorice, and slushie mix. Two Girls and a Cupcake made a Cuban coffee and cinnamon cupcake with strawberry licorice filling topped with coffee buttercream and yogurt-covered pretzels. All of the ingredients would be good in a cupcake by themselves, but all together they seemed like a mess. Glenn the Baker made a jalapeno-beef jerky chocolate cupcake with cream cheese and cheese puff sprinkles. I agree with Florian, the cheese puff sprinkles don't have a strong enough presence to count as an ingredient. 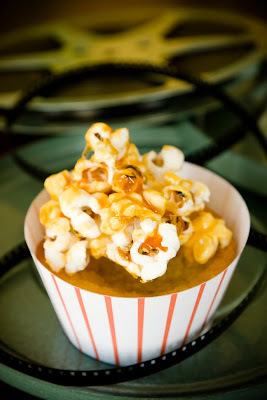 The two men from Sweet Daddy Cupcakes attempted to make a cupcake using beef jerky, nacho cheese, and slushie mix. As gross as it sounds, I was interested to see what the judges thought of it. Sadly, the men took too long preparing the batter and didn't finish in time. Last, but not least, Bake You Happy created a cherry cola chocolate cupcake with a red licorice filling, topped with marshmallow creme and yogurt-covered pretzels. The judges loved this cupcake, although Candace suggested using regular pretzels instead of yogurt-covered ones. 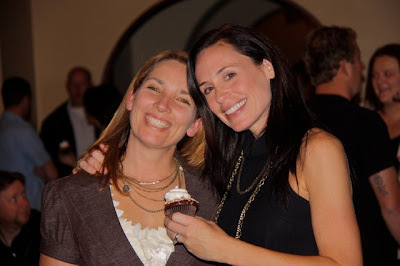 My friend Carrie was able to attend Bake You Happy's viewing party. She brought me home a cupcake from the party, which is the same cupcake that Bake You Happy made in round one. She made one change: regular pretzels. And my honest opinion is: that cupcake was amazing! My husband and I were fighting over it! 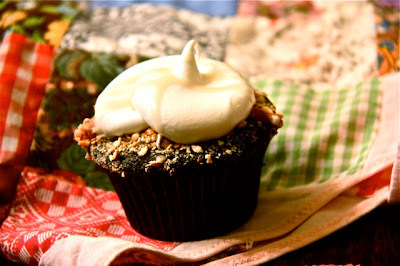 The pretzels added the perfect crunchiness and saltiness to the cupcake. I would definitely eat this cupcake again! Maybe I was biased because I already knew I liked Bake You Happy, but they seemed to be the forerunner the entire episode. Bake You Happy was right to create futuristic cupcakes and display for the LA Auto Show. Glenn The Baker had a great car theme, but it just wasn't right for the LA Auto Show. In the end, I wasn't too surprised when Bake You Happy won. I can't wait until next week's episode. Did you catch last night's episode of Cupcake Wars? I love this show more and more with each episode I watch. I was so excited to see Bake You Happy, a Southern California cupcakery, take the win! Between their viewing party last night and the busyness of opening their new store, I was able to score an exclusive interview with Kim and Kim, owners of Bake You Happy. How did you get started baking cupcakes? We both have been baking since we were little. Kim and I met one day at 5am kickboxing class and would share recipes, ideas, and pictures of our creations. We respected each others talents and shared a love of baking, especially for our family and friends. So 9 months later we decided to make a career out of something we love and start a business together! It has been so much fun! Kim and I really balance each other. We make a great team. What, if anything, did you do to prep for "Cupcake Wars"? Since we are in season 2, we were able to watch season 1 to know what to expect, especially from the judges. We definitely experimented with some recipes as well. What were you most worried about on "Cupcake Wars"? From watching the first season, we really worried about time as well as being able to create something in such a short amount of time with ingredients we had quite possibly had never used before. If you could change anything that happened on your episode of "Cupcake Wars," what would it be? Honestly, I don't think I would change one thing. It was such an amazing experience. I can't say enough good things about the people that work on the show. Was Candace Nelson really that nice in person? Candace was lovely. Not only was she so very nice and beautiful, but she seems to have a great sense of humor. She was always smiling. I really enjoyed the opportunity to meet her and spend a little time with her on the show. Tell us one thing about "Cupcake Wars" we didn't know. Florian isn't as scary as he seems. Do you have plans yet for your prize money of $10,000? We absolutely do...we are putting right back into our cupcake and cake business. We are opening a retail location in Santa Clarita in the next few days. 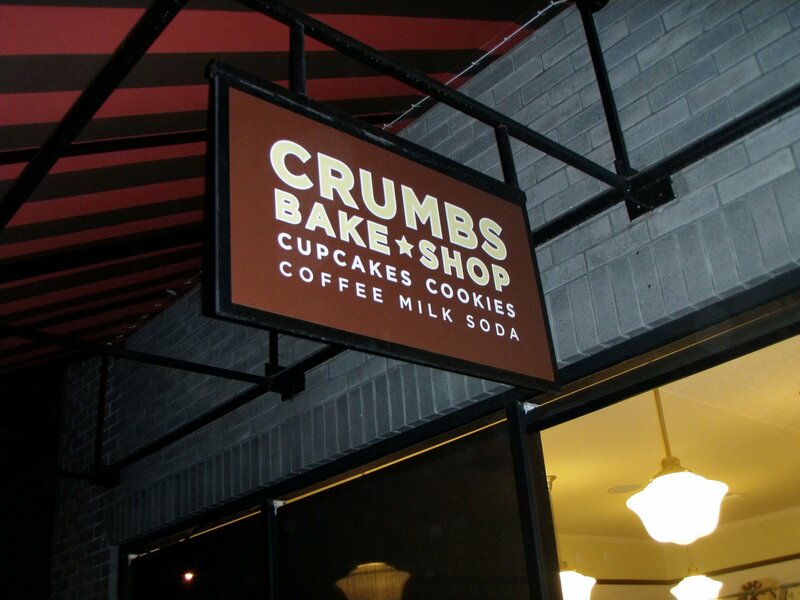 What will set your shop apart from the other cupcake shops in your area? We have delicious moist cakes as well as cupcakes. We have cupcakes available daily and we do take custom cakes orders for weddings, birthdays, etc. as well. Kim and I have over 50 years of baking experience together. We love our community and the people in it. We hope our cupcakery is a place people can come and know they are not only going to get a delicious cake, but feel comfortable, taken care of and walk away satisfied and Happy:)! 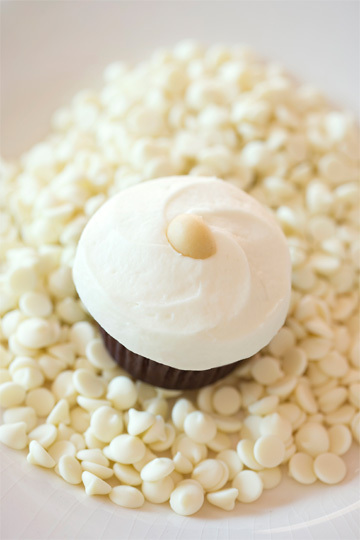 One last question, what's your favorite cupcake flavor? 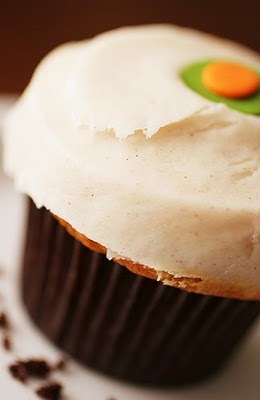 It depends on the season, the day and my mood:)..But today, I would have to say our Lemon Cupcake. It is a vanilla cake with lemon curd filling and topped with lemon zest cream cheese frosting...YUM! And there you have it. Congratulations to Kim and Kim of Bake You Happy, the newest champions of Cupcake Wars! I can't wait to see your new cupcake shop. Good luck with the new venture! I love seeing so many Southern California shops featured on Cupcake Wars. Tonight's episode features one from Castaic, CA. Bake You Happy is a custom made-to-order cake and cupcake company...until now. This week they will be opening a retail shop in Valencia, CA! Congrats to them! 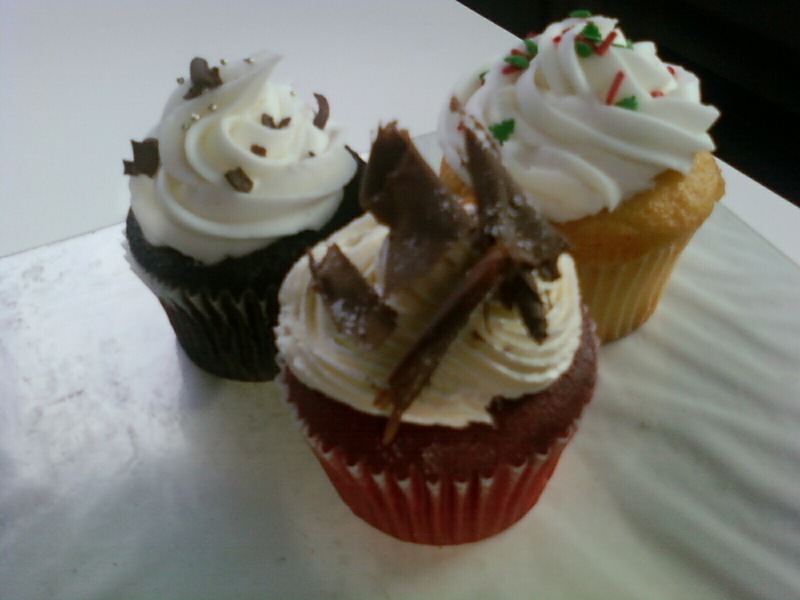 I tasted and reviewed a cupcake from Bake You Happy almost two years ago. I think they have what it takes to win Cupcake Wars. We'll find out tonight at 9pm on the Food Network. The other bakers on tonight's show are Sweet Daddy Cupcakes (Glendale, AZ), Two Girls and a Cupcake (Miami, FL), Glenn The Baker (Los Angeles, CA, another Southern California bakery!). What do you think of this season of Cupcake Wars so far? I love being introduced to cupcake shops and bakers from around the United States. Now I know exactly where to go when I'm traveling. Before you say anything...I agree. It's way too late for me to be posting a review with Christmas cupcakes. The pictures date my review to about a month ago. Better late than never, right? North Orange County is definitely lacking in the cupcake department. I'm tempted to just open a shop myself (bad idea considering I'm not a baker)! 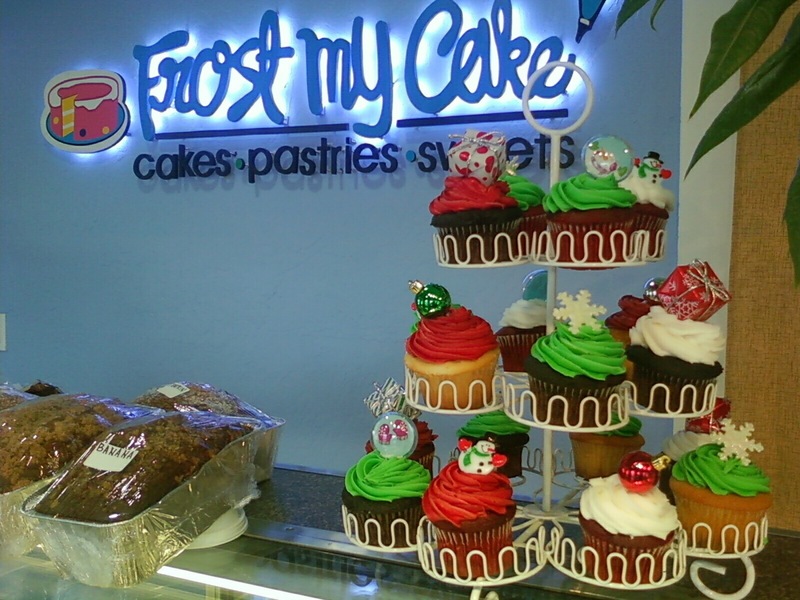 I got very excited when I heard that Frost My Cake bakery opened in Brea, CA. My mom had a coupon for a free cupcake, so we decided to give it a try. 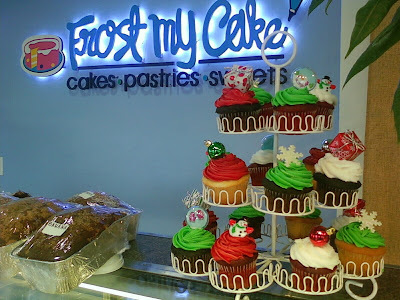 I had hopes of finding a cupcake shop, but Frost My Cake is a bakery that sells cupcakes in addition to cakes, pastries, breads, and other sweets. The girl behind the counter was very friendly and waited patiently as my mom, my brother, and I decided what to pick. Since we all have a huge sweet tooth, we left with three cupcakes, a piece of red velvet cake, a fruit pastry, and snickerdoodle cookies. I love a good cookie and Frost My Cake definitely satisfied my cookie craving. The snickerdoodle cookies were soft and delicious. Only one of the cupcakes was mine; the red velvet, of course. I liked the chocolate shaving decoration on top. The frosting was so-so. It wasn't whipped cream, but it was way too sweet for a cream cheese frosting. The cake was moist, which is always a plus. Frost My Cake seems to be your average bakery full of lots of tasty treats. You won't find gourmet cupcakes, but you can find cupcakes to satisfy your short-term craving. The Coffee Shop is located in Gilbert, AZ. 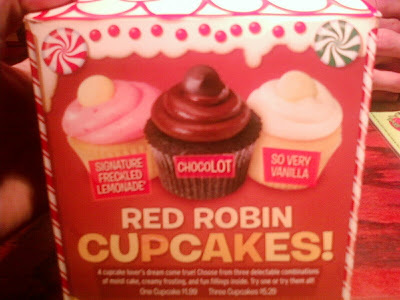 Guess where I was two months ago and missed out on cupcakes?...Gilbert, AZ. To redeem myself, I was very focused on my husband's Ironman race that weekend. I love that they think out of the box and make their cupcakes a little different. Although The Coffee Shop was cut in the first round, their cupcakes look delicious (although I'm pretty sure I don't want to try their Coffee & Cigarette cupcake). 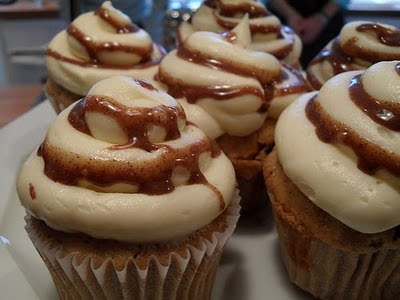 And despite Florian Belanger saying their vegan carrot cupcake was awful, The Coffee Shop is serving that exact cupcake this week to see what their customers think. The next time I'm in Gilbert, I will definitely by stopping by this rocker cupcake shop. Sorry to say, but I haven't found a vegan cupcake that I've liked. I've had some where I thought, "this is good for a vegan cupcake." Doesn't count. Despite my so-so feelings about vegan food, Chef Chloe's cupcakes were making me salivate! And it wasn't just me...the judges loved her cupcakes too. Chef Chloe was cut on the second round. My guess is because hers weren't decorated as much as the others. She's at a slight disadvantage because she doesn't use food coloring. 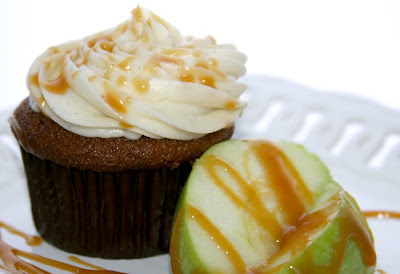 But after looking at her website and seeing all of that tasty food, I'm willing to give vegan cupcakes another try. I think she's based out of LA, so I need to track her down. I actually thought her cupcake display was the best and fit more with the theme of the event. I also loved the giant cupcake on the display. Dollhouse Bake Shoppe is a custom online cupcake shop based out of Santa Monica. Even though they are based out of the LA area, I haven't gotten to try their cupcakes yet. Hopefully they'll have cupcakes at an event I'm at soon. Congrats to Sweet! By Good Golly Miss Holly for their second win on Cupcake Wars. They are the only company with two competition wins! My favorite part of their winning cupcakes was the birds nest decoration. So cool. Sweet! By Good Golly Miss Holly is located in Orlando, FL. Sadly, that's on the over side of the USA. If I ever go to Disney World, I will have to stop by Sweet to taste their award-winning cupcakes. What did you think about this episode of Cupcake Wars? Do you think the right winner was chosen? Should there be more episodes with past winners or should the competition only use each shop once to share the spotlight with others? Sugar Rush: a cupcake extravaganza! is just around the corner. Join fellow cupcake lovers for a free afternoon full of cupcakes, a cupcake competition, food trucks (Kogi BBQ, The Burnt Truck, and Just Chillin' Ice Cream Truck), activities for kids and adults, music, shopping, and lots and lots of sugar! The event benefits Orangewood Children's Foundation in Orange. If you're interested in being a vendor or would like to be entered in the cupcake competition, contact the event organizer, Shastin (714-641-3112 or shastinf@hotmail.com). Guests will receive 4 tickets for each $5 donated to Orangewood Children's Foundation. One ticket = one mini cupcake. 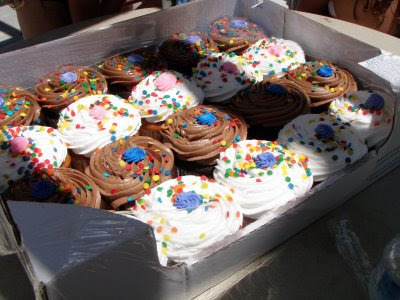 Each cupcake vendor will have 200-300 mini cupcakes, so make sure you arrive early to get your choice of cupcakes. I'll be there eating lots of cupcakes in the cupcake competition along with fellow judges Kim and Jason from Saturday Night Foodies and cake artist, John Jennison. Hope to see you there! 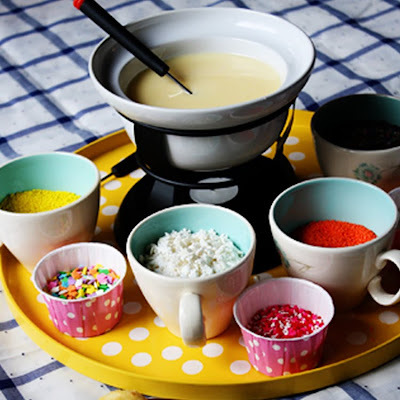 Amanda from Bake It Pretty was interviewed by Pint Size Social and gave us a tutorial of how to make Cupcake Fondue. Sounds amazing, doesn't it? If you come to my house for my next party, it will definitely be there! You can check out the interview and tutorial here. Last summer I reported on the opening of Casey's Cupcakes in Riverside, CA. I haven't tried their cupcakes yet, but I'm seen them and they look delicious! The owner, Casey Reinhardt, was on the MTV reality show "Laguna Beach," so her announcement of a new Laguna Beach store totally makes sense. According to their Facebook page, Casey's Cupcakes is expanding to Laguna Beach and will be opening shop on Valentine's Day. Although this will be the flagship store, the cupcakes will continue to be made at the The Mission Inn in Riverside. ATTENTION ALL CUPCAKE BAKERS!! I received the following announcement from Super Delicious, the production company that makes Cupcake Wars. Now casting Season 3 of The Food Network's hit new competition show, "Cupcake Wars"! We are casting bakers (store owners, caterers, pastry chefs, new bakers...) NATIONWIDE, so get in touch with us ASAP to apply for the show. We are looking for great bakers with AMAZING personalities in every city. Be sure to tell us what makes you the perfect candidate for "Cupcake Wars"! B Sweet Catering is a catering company based out of Los Angeles that sells cupcakes, cookies, muffins, bread, pies, and cakes. I recently posted about some adorable Mickie and Minnie Cupcakes that B Sweet is selling. 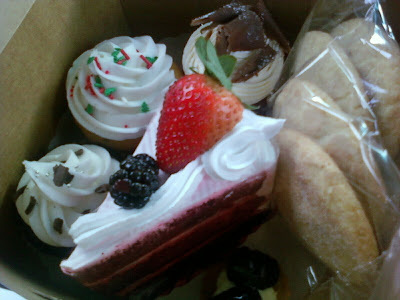 I haven't tried cupcakes from B Sweet yet, but I hope to soon. Yesterday B Sweet officially opened their online store! This is good news for you if you haven't tried their cupcakes yet. The B Sweet SHOP sells cupcakes by the dozen, along with Barb's Famous Chocolate Chip Banana Bread (yum! ), cookies by the dozen, and B Sweet Apparel. 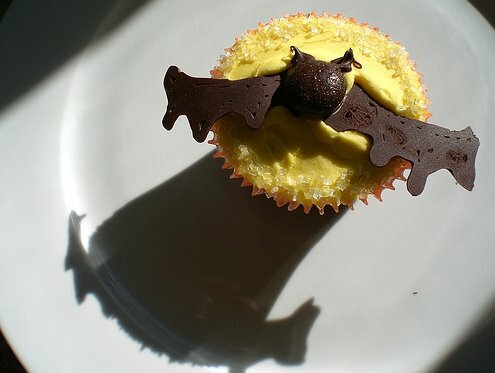 I personally love the Bat Cupcake T-shirt. To celebrate the grand opening of the B Sweet SHOP, get 15% off your order when you use the code CUPCAKEACTIVIST. Offer is good today until Friday, January 7th. Hard to believe that 2010 is over. I must be getting old because time is going by so fast! To celebrate the beginning of a new year, here are the top 10 most popular pages viewed by you on this website. Thanksgiving is a popular holiday for desserts, so why not cupcakes? 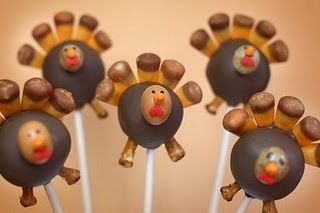 I love these super cute turkey cake pops from Bakerella. Every time I visit Whole Foods they have a different kind of cupcake just waiting for me to buy. Their cupcakes are huge too! Last year Cinnabon came out with a new line of Cinnabon cupcakes. I would quite call them cupcakes, but I would definitely call them delicious! 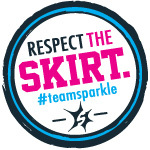 #7 The Sprinkles Truck is Here! Since I wrote this post, the mobile truck industry has exploded in Southern California! I love food trucks! 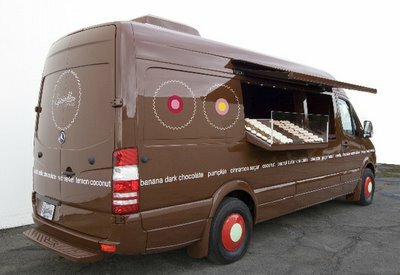 I just wish this Sprinkles truck came to Orange County. You can find almost everything at Costco, so of course it's not surprising to find cupcakes. Their cupcakes are about what you'd expect from your average grocery store, but of course at wholesale prices. I'm not sure if Starbucks even still sells cupcakes anywhere, but it looks like a lot of you are still looking for them. It's no surprise that people are interested in finding out just how many calories are in a Sprinkles cupcake. Trust me, finding out won't stop you from enjoying them. This was the #1 post from 2009. Who wouldn't love red velvet cupcakes in cookie form? The big question: how to ship cupcakes? So many people want to know. 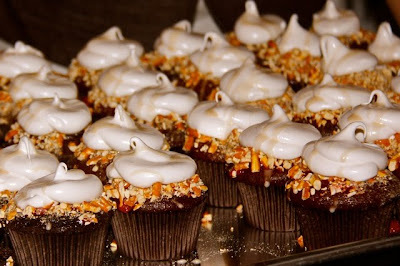 ...and the most popular post was #1 More Halloween Cupcakes. 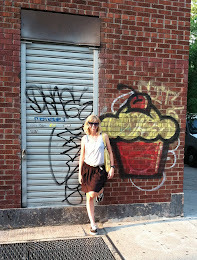 Looking forward to many more cupcake adventures this next year. SusieCakes is offering two baking classes in the month of January at each of their six locations. You can attend the Cupcake Decoration Class or Layer Cake Decorating Class. Guest will learn how to color buttercream, work with decoration techniques (flowers, dots, patterns) & inscriptions. Limited availability. The Newport Beach classes take place on January 8 5-6:30pm (Cake Class) and January 22 5-6:30pm (Cupcake Class). and my favorite cupcake shop of all time is Elizabethan Desserts! I hope you enjoyed my list. There are still so many cupcake shops that I haven't tried yet, so this list will definitely be ever-changing. Do you know a cupcake shop that I should visit and review? Let me know so I can add it to my list of shops to visit in the future. Happy New Year! I predict a year full of lots of cupcakes!